New research from Fidelity’s Viewpoints. Reprinted with permission. Visit here. When it comes to Social Security, it can be tempting to take the money and run as soon as you’re eligible—typically at age 62. After all, you’ve likely been paying into the system for all of your working life, and you’re ready to receive your benefits. Plus, guaranteed monthly income is nice to have. Health status, longevity, and retirement lifestyle are 3 key factors that can play a role in your decision on when to claim your Social Security benefits. You may not be able to predict the true impact of these variables, but you can rely on the simple fact that if you claim early versus later, you will likely have lower benefits from Social Security to help fund your retirement over the next 20–30+ years. If you start taking Social Security at age 62, rather than waiting until your full retirement age (FRA), you can expect up to a 30% reduction in monthly benefits with lesser reductions as you approach FRA. Remember, FRA is no longer age 65. It now ranges from 66 to 67, depending on your date of birth (see your full retirement ageOpens in a new window). And your annual cost-of-living adjustment (COLA) is based on your benefit. So if you begin Social Security at 62, and start with reduced benefits, your COLA-adjusted benefit will be lower too. Waiting to claim your Social Security benefit will result in a higher benefit. For every year you delay past your FRA, you get an 8% increase in your benefit. That could be at least a 24% higher monthly benefit if you delay claiming until age 70. But, make sure to evaluate your decision based on how much you’ve saved for retirement, your other sources of income in retirement, and your expectations for longevity. If you claim Social Security at age 62, rather than waiting until your full retirement age (FRA), you can expect up to a 30% reduction in monthly benefits. For every year you delay past your FRA up to age 70, you get an 8% increase in your benefit. So, if you can afford it, waiting could be the better option. Health status, longevity, and retirement lifestyle are 3 variables that can play a role in your decision on when to claim your Social Security benefits. 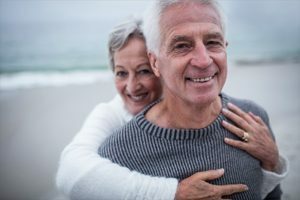 While many people could benefit from waiting to age 70 to take Social Security payments, others may need this source of guaranteed income sooner to help pay their bills, or may anticipate that they may not live long enough to reap the rewards of delaying. For illustrative purposes only. Note: All lifetime benefits are expressed in today’s dollars, and life expectancy of 89. The numbers are sensitive to, and would change with, the discount rate (the rate used when discounting the future benefit payments for each claiming age) and life expectancy assumptions. Consider the following hypothetical example. Colleen is 62 as of 2019. 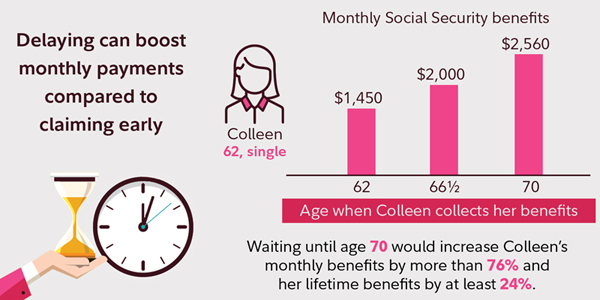 If Colleen waits until age 66 and 6 months (her FRA) to collect, she will receive approximately $2,000 a month. However, if she begins taking benefits at age 62, she’ll only receive $1,450 a month. This “early retirement” penalty is permanent and results in her receiving up to 28% less year after year. Several Social Security claiming strategies were eliminated in 2015 including the ability to file a “restricted application for spousal benefits,” which allowed you to claim benefits based on your spouse’s work record and then switch to claiming on your own work record at a later date. This strategy is no longer possible if you turned age 62 after December 31, 2015. Claiming before your FRA on a spouse’s record means you’ll lose even more than claiming on your own record—the benefit reduction for a spouse is up to 35% while the reduction for claiming your own benefit is up to 30%. For instance, if you’re the spouse of Colleen in the above example and you are the same age, you’d be eligible for only $675 a month at age 62, 33% less than the $1000 a month you would get at your FRA of 66 and 6 months. Your decision to take benefits early could outlive you. If you were to die before your spouse, they would be eligible to receive your monthly amount as a survivor benefit—if it’s higher than their own amount. But if you take your benefits early, say at age 62 versus waiting until age 70, your spouse’s survivor Social Security benefit could be up to 30% less for the remainder of their lifetime. Remember that while you are eligible for reduced Social Security benefits at 62, you won’t be eligible for Medicare until age 65, so you will probably have to pay for private health insurance in the meantime. That can eat up a large chunk of your Social Security payments. For the average 55- to 64-year-old, total health care spending was $10,137 in 2016 (including $1,310 in out-of-pocket spending ).3 Taking Social Security early to pay for temporary health care cost locks in a permanent Social Security reduction. Many people want to retire as soon as it is financially feasible to do so, but it’s crucial to consider the earning and investing power you may give up if you stop working full-time and take Social Security at 62. If you leave a job with good pay and benefits, it may be difficult ever to regain that level of compensation if you need or want to return to work later. Of course, not everyone can keep working, but it is something to consider if you are healthy and have the opportunity to stay in the workforce, in either a full-time or part-time capacity. Tip: Women often live longer than men, and are more likely to depend on one income when they are older. Don’t make the mistake of coupling your decision to leave the workforce with your Social Security claiming strategy. Remember, by the time you get into your 80s, you have fewer financial options, so don’t jump at the first opportunity to claim Social Security at age 62 just because you may want to quit your current job. But there’s even more to the story. As you approach retirement, you’re often at the upper-end of your lifetime earnings trajectory—and of your ability to save more for retirement. In addition, if you can keep working, you can make “catch-up” contributions to a tax-deferred workplace savings plan like a 401(k) or 403(b) or a traditional or Roth IRA. Catch-up contributions allow you to set aside larger amounts of money for retirement. Remember, if you decide to stop working at 62, you will cease tax-advantaged saving opportunities and cap your Social Security benefits throughout your retirement—and you may need to begin to draw down your savings earlier than you want. When you factor in longevity, health care, and the cost of your expected lifestyle in retirement, your decision on whether or not to claim Social Security at age 62 may become clearer.